I enjoyed the video below of high quality antique miniature furniture produced by Antiques TV. These aren’t your ordinary dollhouse furniture pieces – they are very well made and use high quality materials. I’ve always admired high quality miniature furniture – a completely different realm from dollhouse furniture. A specialty niche for sure. To make it you’d need good eyesight, small steady & nimble hands – patience would probably be a good quality to have also. It’s funny that he didn’t mention practice. I wonder if cabinetmakers or apprentices would have used smaller models to hone their craft? Extremely interesting video, many thanks for posting it. I always have loved miniature furniture and never pass one up at an antiques show to stop and admire it. It seems like some of the really best was made in England. I bought my wife a miniature Eastlake dresser for Christmas last year and she uses it to keep her jewelry in. I often wonder what its original intention was? I’m guessing a sales mans sample, but I could be totally wrong here. In any event, the drawers are nicely dovetailed and the quality of construction is extremely well executed. 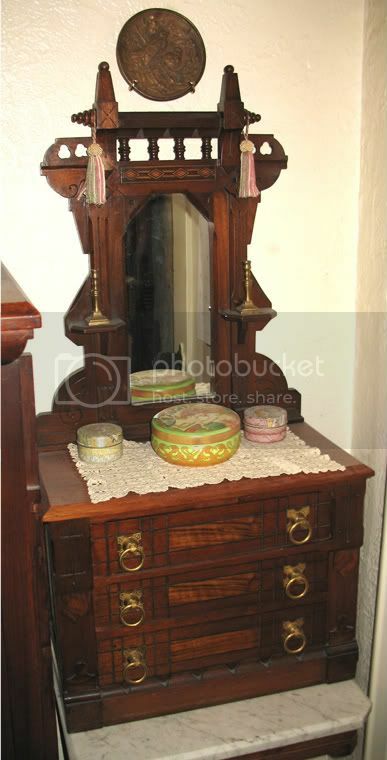 The proportions are off as compared to a full size dresser but that actually adds a charm of its own. The video was quite interesting to watch. The craftsmanship of each piece was superb. It makes me want to invest in cable, so that I can access “Antiques TV.” Thank you for sharing it with everyone.